*Dr. Friedman has always been very courteous & efficient. He & his staff make for very comfortable visits. Very much on top of my ailment & a very good listener. Feel very much at ease with treatments. Could not be happier with Dr. Friedman. very good Doctor, took time with Me. Dr. Friedman is excellent. He preformed an outsanding surgery and gave me my voice back. He is very thorough, patient, excellent listener answers questions & explains. Dr. Friedman was enthusiastic and thoughtful in his effort to diagnosis and help me with my issue. I have already recommended him to several people. Dr. Friedman was great in every aspect of this visit. His demeanor, professionalism, empathy, and knowledge was top notch. He took the time to understand my complaint, ask the proper questions, and conducting the physical exam and testing as needed. I am so pleased with the outcome of this visit compared to my last visit. Ideal Characteristics of a Laser-Protected Endotracheal Tube: ABEA and AHNS Member Survey and Biomechanical Testing. To determine the characteristics of laser-protected endotracheal tubes (LPETs) valued by otolaryngologists performing transoral laser surgery in the head and neck and to measure LPET stiffness. An online questionnaire was completed by American Broncho-Esophagological Association (ABEA) and American Head and Neck Society (AHNS) members. LPET distal end compliance was measured in a biomechanics laboratory. A total of 228 out of 2109 combined ABEA and AHNS members completed the survey. The following LPET characteristics, which were properties of the Medtronic Laser-Shield II tube (MLST), were highly valued: softness and flexibility, surface smoothness, and a tight-to-shaft balloon (all P < .01). Prior to industry-driven discontinuation of the MLST, 52% of surgeons (78% of fellowship-trained laryngologists [FTLs]) reported using it; afterward, 58% reported using the stainless steel, Mallinckrodt Laser-Flex tube (MLFT). Forty-six percent of all respondents (69% of FTLs) did not consider cost being a factor in LPET choice. Biomechanical testing revealed the distal end of the MLST to be 3.45 times more compliant than the MLFT ( P < .01). Members of the ABEA and AHNS, particularly FTLs, highly value distinguishing properties of the now discontinued MLST. Manufacturers should consider this in the design of new LPETs. Paradoxical Vocal Cord Motion in Pediatric Patients. Paradoxical vocal cord motion (PVCM), also termed vocal cord dysfunction, is a poorly understood disorder of episodic dyspnea characterized by inappropriate vocal cord adduction during inspiration and potentially during expiration. It can coexist or be confused with asthma, so appropriate diagnosis is key to optimizing treatment success. Although many patients with PVCM may have underlying psychologic issues, there is emerging evidence to suggest that this entity is not psychogenic in every patient. Both laryngeal irritants and exercise have been identified as additional contributing factors in PVCM. Diagnosis of PVCM requires awake laryngoscopic confirmation. However, many patients do not exhibit signs of PVCM during this examination, despite provocation during testing. Therefore, clinical history remains key in determining which patients should proceed with behavioral therapy under the guidance of a speech pathologist. In addition, treatment may include limiting patient exposure to potential sources of laryngeal irritation. Refractory patients may benefit from psychologic assessment and treatment. [Pediatr Ann. 2016;45(5):e184-e188.]. Bedside Injection Medialization Laryngoplasty in Immediate Postoperative Patients. The morbidity of glottic insufficiency resulting from unilateral vocal fold immobility may significantly compromise postoperative recovery in patients with decreased pulmonary reserve or inability to protect their airway. Injection medialization laryngoplasty is an effective means of treating glottic insufficiency due to unilateral vocal fold immobility. The purpose of this study is to present our experience with bedside transoral injection medialization laryngoplasty in the immediate postoperative period. Patient demographics, clinical characteristics, procedural details, and short-term outcome measures of oral intake were recorded in a cohort of 68 patients over 5 years with unilateral vocal cord paralysis who underwent injection medialization as a bedside procedure in the immediate postoperative period. Mean time to injection was 8.2 days postoperatively. At the time of injection, 40 of 68 patients were nil per os. Seventy percent (28 of 40) had their diet advanced to adequate oral intake within 5 days of injection. Greater than half of the injections (36 of 68) were performed in the intensive care unit. No complications were noted, and all patients in this cohort were able to tolerate the bedside injection. Bedside injection medialization laryngoplasty in the immediate postoperative period via the transoral approach can be performed in patients, even in the intensive care unit, while on anticoagulation, and may be of benefit for hospitalized patients with unilateral vocal fold immobility. Further studies quantifying improvement in voice and swallowing data are merited. Effect of mandibular tori on glottic exposure during simulated suspension microlaryngoscopy. Mandibular tori have been identified as a contributing factor in difficult exposure during intubation. However, no investigation has measured the effect of mandibular tori on glottic exposure during suspension microlaryngoscopy (SML). The objective of this study was to measure how the size and location of mandibular tori affect glottic exposure during simulated SML at different thyromental distances. Suspension microlaryngoscopy was modeled on an anatomically accurate skull and larynx with thyromental distances between 6 and 12 cm. Mandibular tori were simulated by protruding screws 5 to 15 mm from the lingual aspect of the mandible. The tori were positioned either 15 mm (anterior) or 25 mm (posterior) from the midline of the symphysis. The glottic exposure for the various-size tori in each location was measured by recording the displacement of the glottiscope tip relative to the most anterior exposure achievable without tori. The glottiscope angle relative to the horizontal plane was measured for each condition. Mandibular tori of more than 10 mm had a significant impact on glottic exposure. Displacement of the glottiscope tip ranged from 2 to 9 mm for anteriorly placed tori and from 7 to 29 mm for posteriorly placed tori, with larger tori causing greater displacement. Increasing the thyromental distance increased the posterior glottiscope tip displacement regardless of torus size or location. The glottiscope angle increased with larger tori (12º to 28º), but this angle did not change with increasing thyromental distance. Larger size and more-posterior location of mandibular tori more significantly reduce glottic exposure during SML. The inner table of the mandible is the most relevant anatomic constraint on glottic exposure, which varies with the presence or absence of mandibular tori independent of thyromental distance. Salvage endoscopic angiolytic KTP laser treatment of early glottic cancer after failed radiotherapy. Management of early glottic cancer subsequent to failed radiotherapy is challenging, especially in balancing oncological control and function preservation. Patients frequently have been incentivized against surgical management and thus have undergone radiotherapy as initial treatment. This history compounds the difficulty of discussions about surgical management after recurrence. Typically, endoscopic salvage has less morbidity than transcervical partial laryngectomy and is clearly desirable over total laryngectomy. However, there are appropriate concerns about the efficacy of endoscopic salvage and the overarching impact on larynx preservation and survival. Given our success with endoscopic angiolytic KTP laser treatment of previously nonirradiated T1 and T2 glottic cancers, we examined our results from treating similar-sized lesions after failed radiotherapy. We performed a retrospective chart review of 20 patients from our cancer database who had undergone failed radiation therapy elsewhere for early glottic cancer and then underwent endoscopic angiolytic KTP laser treatment. Analysis of the geographic tumor recurrence of the 20 patients revealed T1a N0 M0 cancer in 4 patients, T1b N0 M0 cancer in 1 patient, T2a N0 M0 cancer in 1 patient, and T2b N0 M0 cancer in 14 patients. After KTP laser salvage treatment, 4 patients (20%) had local recurrence (all T2b) and required subsequent total laryngectomy, and 3 of these patients (15%) ultimately died of disease. The remaining 16 patients (80%) were free of disease at least 2 years after endoscopic salvage (average follow-up, 39 months). Our investigation provides preliminary evidence that angiolytic KTP laser salvage treatment of early glottic cancer is an effective treatment after failed irradiation. Studies with larger cohorts and longer follow-up will be necessary to establish incontrovertible evidence of its efficacy. Voice outcomes for photoangiolytic KTP laser treatment of early glottic cancer. Surgery and radiotherapy routinely provide high cure rates in treating early glottic cancer. Therefore, key metrics for success are optimal voice outcome and preservation of future cancer treatment options. Remarkably, there is a paucity of pretreatment versus posttreatment voice outcome data. Angiolytic KTP (potassium titanyl phosphate) laser treatment of early glottic cancer with ultranarrow margins was initiated to better preserve vocal function. Given that effective oncological results have been achieved, it was hypothesized that this approach would also result in improved posttreatment measures of vocal function that more closely approximate historical norms than pretreatment values. 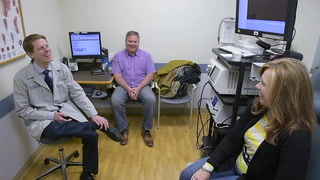 Pretreatment and posttreatment voice outcome data were obtained for 92 patients (64 with T1 cancer and 28 with T2 cancer) who underwent 532-nm KTP laser treatment of early glottic cancer in a study design in which each patient essentially served as his or her own control. The evaluations included objective measures (acoustic and aerodynamic) and patients' self-assessments of vocal function (Voice-Related Quality of Life; V-RQOL). A series of mixed analyses of variance were conducted for all vocal function measures, with tumor stage and depth of invasion as the between-subjects variables and time (presurgery versus postsurgery) as the within-subject variable. There were statistically significant (p < or = 0.05) postoperative improvements for acoustic (perturbation and noise-to-harmonics ratio) and aerodynamic (subglottic pressure and vocal efficiency) measures of vocal function, as well as for V-RQOL assessment. Comprehensive pretreatment and posttreatment voice measures in a large patient cohort demonstrated that the KTP laser significantly improved postoperative vocal function in patients with early glottic cancer. Furthermore, radiotherapy was preserved as an oncological treatment option. We assessed the likelihood of arytenoid dislocation during intubation through the application of controlled force. Six cadaveric human larynges were mounted in an apparatus for simulating forcible collision with the arytenoid complexes. An endotracheal tube tip probe (ETTP) was used to push one arytenoid complex, and a non-slip probe (NSP) was tested on the other. Increasing pressure was applied until the probes either slipped or reached 5 kg of force. Dissection was then performed to assess the integrity of the cricoarytenoid ligament. The forces obtained by pushing an endotracheal tube against an electronic balance were measured to estimate the maximal possible intubating force. None of the ETTP or NSP trials disrupted the cricoarytenoid joint ligaments, and the joint never appeared to be dislocated. The mean maximal forces were 1.8 kg for the ETTP (after which, slippage consistently occurred) and 4.7 kg for the NSP. The mean maximal forces from an endotracheal tube pushed against a scale were 1.5 kg (without stylet) and 4.6 kg (with stylet). Arytenoid dislocation did not happen, and gross disruption of the joint capsule or ligament did not occur, even when the testing approximated the maximum force achievable under extreme conditions. Endotracheal tube insertion thus seems unlikely to cause arytenoid dislocation. Safety and dosing of bevacizumab (avastin) for the treatment of recurrent respiratory papillomatosis. Increasing evidence supports the use of laryngeal injections of the antiangiogenic agent bevacizumab (Avastin) for the adjuvant treatment of recurrent respiratory papillomatosis (RRP). A recent prospective open-label investigation, approved by the US Food and Drug Administration, employing 12.5 mg of sublesional bevacizumab demonstrated single-site efficacy without complications; however, the safety of multiple-site injections and higher dosing has not yet been reported. The primary objective of this study was to report on the safety of increased doses of bevacizumab for the treatment of RRP. Two cohorts of adult patients were evaluated. In the first group, a prospective analysis was performed on patients with a diagnosis of laryngeal RRP after t heir participation in th e initial clinical trial with a single-site lowerdose (7.5 to 12.5 mg). They received higher doses of sublesional laryngeal bevacizumab (15 to 50 mg total) with detailed physiologic, hematologic, and serum chemistry measurements performed before and after each bevacizumab injection. A second cohort of patients received sublesional laryngeal injections of bevacizumab (15 to 88 mg total) without physiologic measurements and underwent a retrospective analysis of reported complications. One hundred consecutive laryngeal injection sessions (office, 87; operating room, 13) with bevacizumab were performed in 43 patients, with a mean dose of 30 mg total per treatment (range, 15 to 88 mg). Sixty-three of the 100 sessions were accompanied by KTP laser photoangiolysis of the papilloma prior to bevacizumab injections. Eighteen patients (cohort 1) underwent detailed physiologic assessment, and no dysfunction was observed. There were no local or systemic complications of bevacizumab administration. The second group of 25 patients (cohort 2) also reported no significant local or systemic complications. Neither patient group was observed to have a local wound problem in the larynx. This investigation provides evidence that higher doses of bevacizumab are relatively safe in adult patients with laryngeal RRP. Further refinements in pharmacologic concentration and drug delivery will determine the optimal treatment regimens in the future. High-speed videoendoscopic analysis of relationships between cepstral-based acoustic measures and voice production mechanisms in patients undergoing phonomicrosurgery. There is increased interest in using cepstral-based acoustic measures for objective clinical voice assessment because of their apparent advantages over more time-honored methods, but there is a paucity of information about how these newer measures relate to underlying phonatory mechanisms. We investigated the relationships between the acoustic cepstral peak magnitude (CPM) and high-speed videoendoscopy (HSV)-based measures of vocal fold phonatory function in 20 subjects who underwent phonomicrosurgery for vocal fold lesions. Acoustic and imaging data were acquired during sustained vowel phonation before and after surgery. The changes in the measures between presurgical and postsurgical assessments showed that the CPM correlated significantly with an HSV-based measure combining fundamental frequency deviation and average speed quotient (r = 0.70; p < 0.001) in a multiple linear regression, and that the variation in the CPM could also be attributed to trading relationships between the HSV-based measures of vibratory phase asymmetry and glottal closure. These initial results demonstrate that the clinical utility of cepstral-based measures can be enhanced by a better understanding of how these acoustic measures relate to underlying phonatory mechanisms. The CPM seems to integrate information about aperiodicity in vocal fold vibration, the relative speed of glottal closure, and estimates of glottal noise generation. Submucosal neoplasms of the laryngeal introitus. The differential diagnosis of endolaryngeal mesenchymal neoplasms includes a wide spectrum of benign and malignant pathologies, which have been rarely photo-documented and assessed as a group. Non-epithelial neoplasms of the endolarynx seen at our centre from 2002 to 2011 (n = 38; 36 treated at our institution) were retrospectively reviewed, with attention to clinical presentation, radiographic imaging, operative management, histology, and pre- and post-operative endoscopy. Submucosal squamous cell carcinomas, mucosal cysts, amyloid and Teflon granulomas were excluded. Twenty-three of a total of 36 patients underwent definitive endoscopic surgical treatment. Supraglottic pathologies included lymphoma, lipoma, neuroendocrine carcinoma, lymphangioma, oncocytoma, haemangioma, synovial cell sarcoma and benign spindle cell neoplasm. Transglottic pathologies included synovial cell sarcoma and granular cell tumour. Glottic pathologies included granular cell tumour, osteoma, rhabdomyoma, rhabdomycosarcoma and myofibroblastic sarcoma. Subglottic pathologies included chondrosarcoma, neurofibroma, adenoid cystic carcinoma and vascular malformation. The site of origin, degree of malignant behaviour and sensitivity to adjuvant treatment determined the course of surgical management, i.e. endolaryngeal versus transcervical, and limited removal versus wider resection. Karen Grigsby Scott shares her journey from fear to triumph over vocal cord cancer. 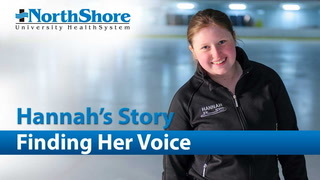 Hannah and her family discuss how Dr. Aaron Friedman and the NorthShore Voice Center helped restore her voice. Dr. Aaron Friedman discusses the benefits of office-based laryngoplasty injections for vocal cord paralysis. Dr. Aaron Friedman discusses the conditions treated at the NorthShore Voice Center. 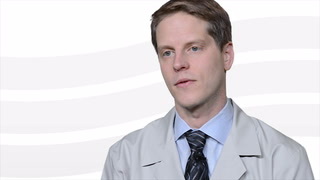 Dr. Aaron Friedman discusses the KTP laser and it's uses at the NorthShore Voice Center.